The precision and a broad range of tonal potential unite ideally in our Model A. 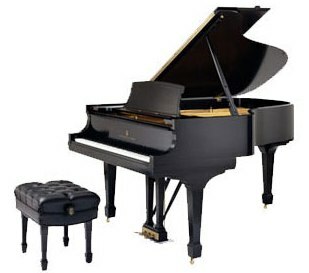 It is a smaller sized concert grand piano, designed also for use in institutions and schools. This piano is ideal for practicing and for those with limited space. Legs Ebonized beech. Locking devices. 4 solid spruce; spruce provides tensile strength with less weight. Maple dowels fasten braces to rim producing a single homogenous foundation upon which is built the entire tonal component. A cast iron treble bell, affixed to rim's underside at treble bend, holds plate firmly in position by means of a steel bolt. The S & S iron wedge anchors brace ends securely to crossblock assuring permanent rim posture. Hexagrip patented design; 6 laminations of quartered hardrock maple and bubinga stock. Grain symmetrically distributed at successive angles of 45° or 90° employing grain direction uniformly around the circumference of the tuning pin to provide the ultimate in pin grippage. As a result of this exclusive design, the tuning pin has smoother movement under torque, a more uniform retaining which will hold its tuning longer. Premium wool top felt over premium wool under felt; treated to resist insects. Compression-wired to retain permanent shape. Hard rock maple moldings. Shanks from select hornbean and maple. White, quarter-sawn hornbean parts are bushed with specially treated wool action cloth for freedom from friction. Parts are anchored in hard bubinga dowels housed in inflexible seamless brass tubing to assure precise & stable regulation. Exclusive single, combination phosphor bronze repetition and fly spring provides constant crisp touch response. Specially designed to respond 14% faster fortissimo and 6% faster pianissimo. European spruce, individually weighed-off. Chip-proof, stain-resistant coverings for naturals; slip-proof, delicately abraded ebonized sharps. Made from planks of stable, quarter-sawn spruce. Horizontal planks are freely mortised together, while their ends are permanently mortised into vertical planks, presenting a vented system for humidity escapement while allowing for necessary expansion and contraction. Front center is crowned contrasting the reverse-crowned action frame for snug fit. This design intensifies key movement and prevents "slapping" during heavy playing. Large beech dowel ends provide a solid mount for adjustable brass touch-regulating screws. 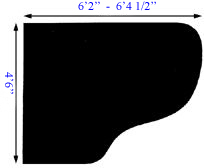 Thickness: 1-3/4" (42 mm).